Who was the last dumb buyer of stocks? Given the market has always risen over any 17 year period, this poor soul must have bought on October 9, 2007 just before the S&P 500 index threw in the towel dropped nearly 50%. That dumb buyer would have “lost” half their money in just a little over a year. However, if she was able to hang on for the ride until today, she would have made her money back and then some. Specifically, $1 million invested at this worst possible time, after falling to about $500,000, would be worth about $1.8 million today (before the 2.2% dividend paid out each year)! In other words, this dumb investor would have a total return of about 7.3% per year. And anyone fortunate enough to have invested on any other day around that time period would have earned more! In fact, I would venture to guess that no long term, diversified investor has earned as low as a 7.3% return since the last market peak. Or at least, they shouldn’t have! 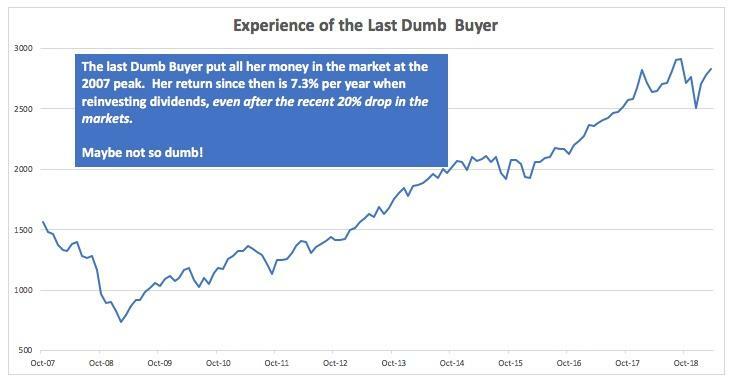 One other thought, the “smartest” investor who put all her money in the market at the bottom in March 2009 has earned a 16.3% per year return. I would bet no one truly made that move either. But earning somewhere between 6.5% and 16.3% should feed a well-structured financial plan quite nicely!